Cards: Star Pics 1992, Gameday 1992, Gameday 1993, ProSet 1992, Fleer 1995, Classic 1992, Photo Memorabilia. I braved a monsoonal torrent down I-35 in traffic for a hour to HEB only to discover after an hour of milling around that store that Gameday Sports Tours had moved the event to another location without notifying anybody. It was literally the perfect storm, as Gameday had become fed up with behavior of other members on a message board and just decided not to update things anymore. While I understand why they did it, overall it strikes me as unprofessional and immature to check out like that. Left in the lurch, the manager at the HEB was able to eventually direct me via the phone to the correct location approximately 5 miles away for the event. With Robert running slightly late (- maybe due to the weather or the driver who also took him to the wrong location,) he expressed a need to leave early due to wanting to watch his son’s football game; However, he heartily signed anything and everything fans had. Robert also is on Twitter and is very vocal about his Alma Mater’s current state of affairs in college football. 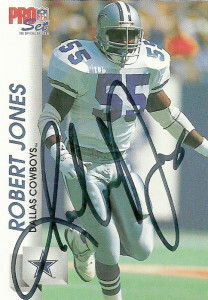 Some great cards here of Robert, it was difficult to choose which ones to get autographed. 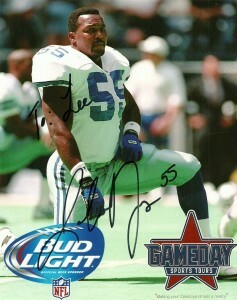 Luckily he hit all these cards for me and penned this garish photo of himself. 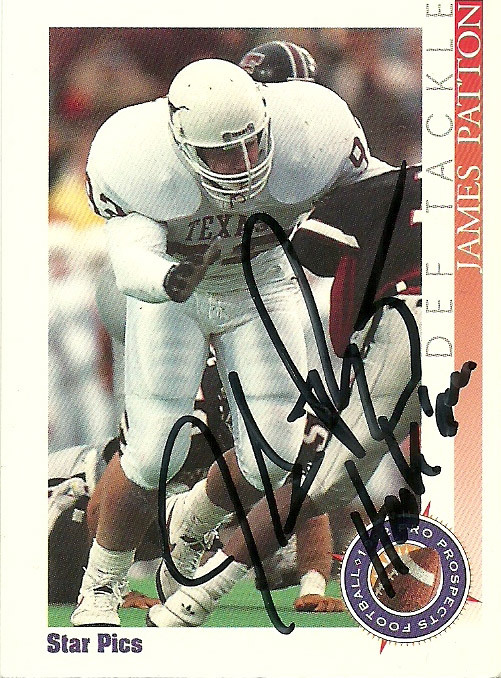 I had always wanted to get his college cards autographed. Both Star Pics and Classic have fallen by the wayside in the garbage of dead companies over the years but I enjoyed their issues very much at the time. 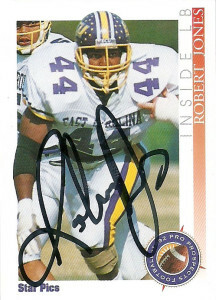 The Gameday and ProSet were all exceptional photoshots of Robert, while the Fleer was just a set grab. There’s probably just one or two more of Jones I’d like to get signed at this point, but otherwise, the event and the haul turned out to balance out a poorly set up event. 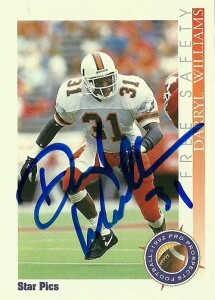 The Miami Hurricanes free safety and head hunter Darryl Williams helped the team win the National Championship in 1989 and 1991. Quick, fast, and fluid, Williams was a great athlete who showed the willingness to apply the hit as well as sit in zone to make the pick. A team leader out of the gate, Darryl had great instincts and reacted well to plays. The knock on him was his lack of size (6’0″, 193) and experience at the position (only a 2 year starter). He’d finish as the Hurricanes 4th all-time leading tackler with 173 total tackles, and 8 picks for 150 yards, 2 td, and 4 fumble recoveries. 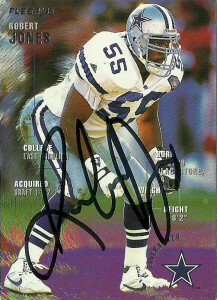 An All American in college recording 84 stops and 3 picks in 1991, Williams would declare early and be drafted by the Bengals in a draft day swap with the Washington Redskins during the first round (#28) of the 1992 draft. It’d be the first time the Bengals would draft a safety in the first round of the NFL draft, underscoring their attempts to keep up with the pass happy Oilers in the AFC Central arms race. 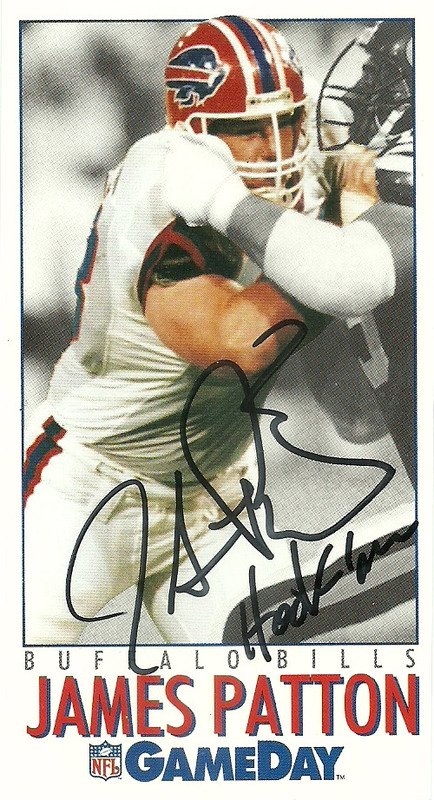 Williams rookie season was a strong performance in 1992, with 4 picks, 2 sacks and 78 tackles starting 12 games that season. It’d be in 1993 that he’d start the oddest of streaks: the NFL record for most consecutive starts by a free safety, a record he still holds to this day with 108 games. 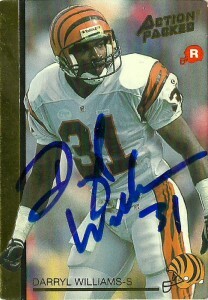 During that season Hitman made an interception that he’d return 97 yards in a 24-16 loss to the Steelers. 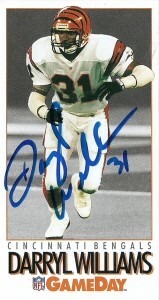 Darryl would also wreck havoc in the secondary recording a career high 126 tackles. He’d also notch a safety in 1995 before heading west to play for the Seattle Seahawks. 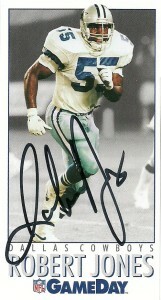 It’d be in 1996 that Williams put together a masterful season with 5 picks for 148 yards and a touchdown. 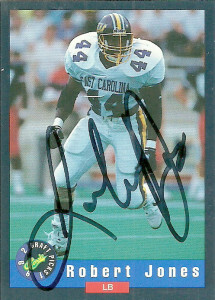 Williams would earn his only Pro Bowl nod and AP nomination in the following season in 1997, where he led the league with 8 interceptions for 172 yards and a touchdown. Although he had a down year in 1998 with 3 picks, and his streak of starts would end in 1999, he’d prove that indeed you can return home, resigning with the Bengals in 2000. 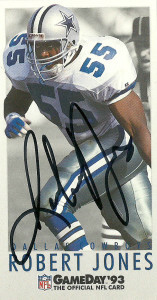 Hitman would play with the squad through 2001, recording a career high 3.5 sacks in his final season. I quit collecting cards pretty much en masse after 1992. GameDay, Action Packed and Star Pics, were the last brands I really liked at that point, but by 1993 everybody had left the style that defined themselves behind, (ProSet and Score,) were out of business, (StarPics,) or were concentrating on premium branding (Fleer) that I just didn’t care about. I sent off for Darryl at the end of August and got a very quick reply in a week. Oddly there was no post mark from where he sent it to me from on the envelope that had taken some water damage, but thankfully the cards were unharmed. He signed the 3 cards I requested, plus the additional card I asked him to keep. A nice return from the Cincinnati Hitman.